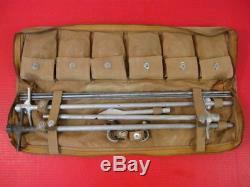 WWII US AAF Army Air Force Type D-1 Airplane Mooring Kit w/Canvas Case - Complete - Nice. This kit is complete with all the hardware items, stakes, poles, metal rods and eye bolts. Each pocket has approximately five stakes. 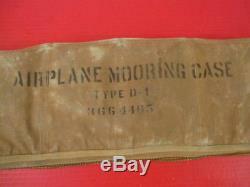 It has the zippered canvas case that was used to store the Type D-1 Mooring Kit. 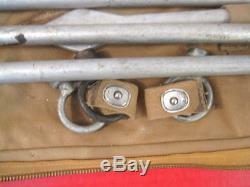 The case has internal pockets and tie straps to secure the components of the Mooring Kit. 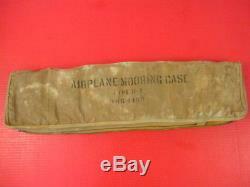 The case is used, please see photo's for condition. The zipper is no longer functional. There is several small holes in the canvas. NOTE: this is a heavy and bulky item! This would make a welcomed addition to any WWII Collection. Check out my other items. 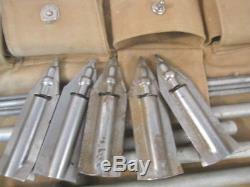 The item "WWII Era US AAF Army Air Force Type D-1 Airplace Mooring Kit withCanvas Case RARE" is in sale since Thursday, October 26, 2017. 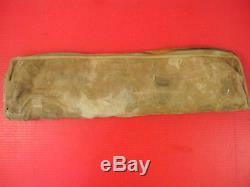 This item is in the category "Collectibles\Militaria\WW II (1939-45)\Original Period Items\United States\Field Gear, Equipment". 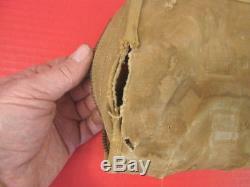 The seller is "koolstuff1958" and is located in Henderson, Nevada. This item can be shipped worldwide.